In Chengdu, we stayed with Nick, a Brit who’s cycled out from the UK (www.cyclingelsewhere.com) and is pausing for a year to experience living in China, topping up his bank balance by teaching English. Once we’d arrived at his apartment and chilled for a bit, we dropped our bikes off at Natooke, an awesome bike shop run by a couple of American guys. The bikes got a good clean up and service ready to take on the rough roads of Central Asia. That evening Nick was working late so we went to meet up with another group of touring cyclists who are pausing in Chengdu teaching English. 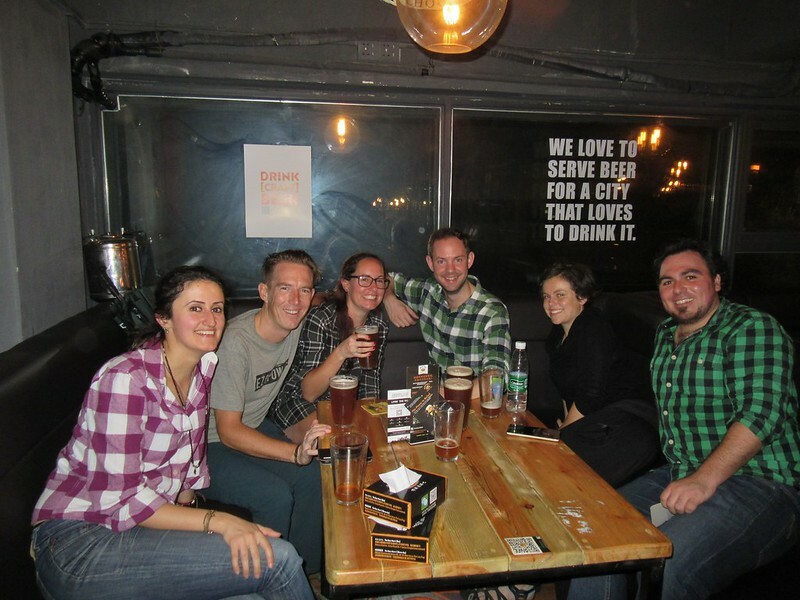 Sarah and Scott from Oz (www.longrodehome.com) contacted us via our Facebook page, inviting us to their place. There, we also met up with Nico and Gokben from France and Turkey (www.frogsonwheels.net). Turns out there’s quite a community of cyclists here and we had a great evening chatting till late, exchanging info and stories from our travels. 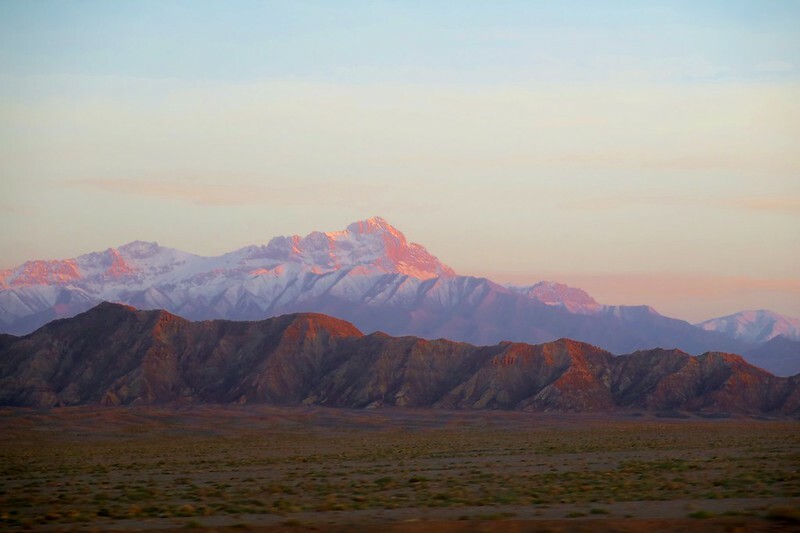 Their tales of the Pamir Highway and arctic winter temperatures in the wilds of Western China were a lot gnarlier than our Thai beaches and perfect Japanese roads but it did stoke the excitement for the adventures we’ve still got to come. We did a token bit of sightseeing in Chengdu, but mostly ate good food and drank coffee at Nick’s place. 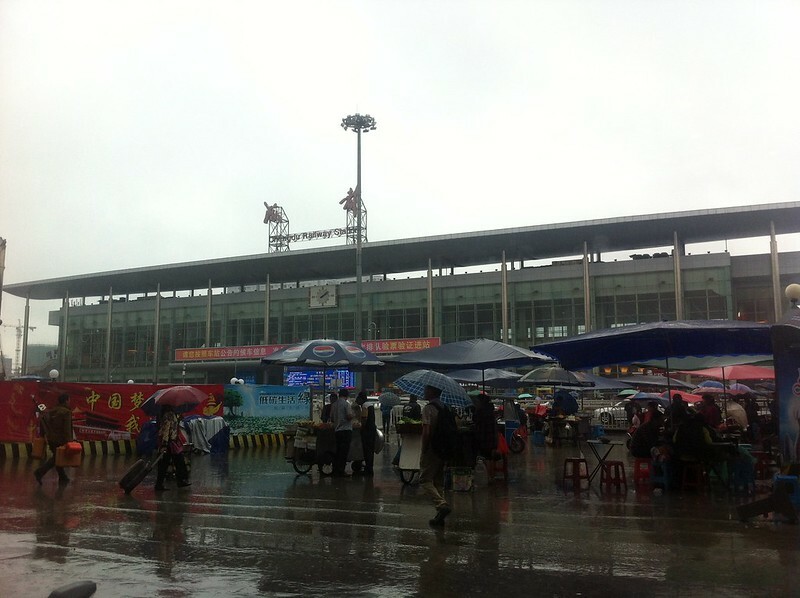 After picking up our bikes which rode like brand new, we took them to the station (in the pouring rain) to send them ahead to Urumqi as freight, leaving us to travel light on our train which left the following day. 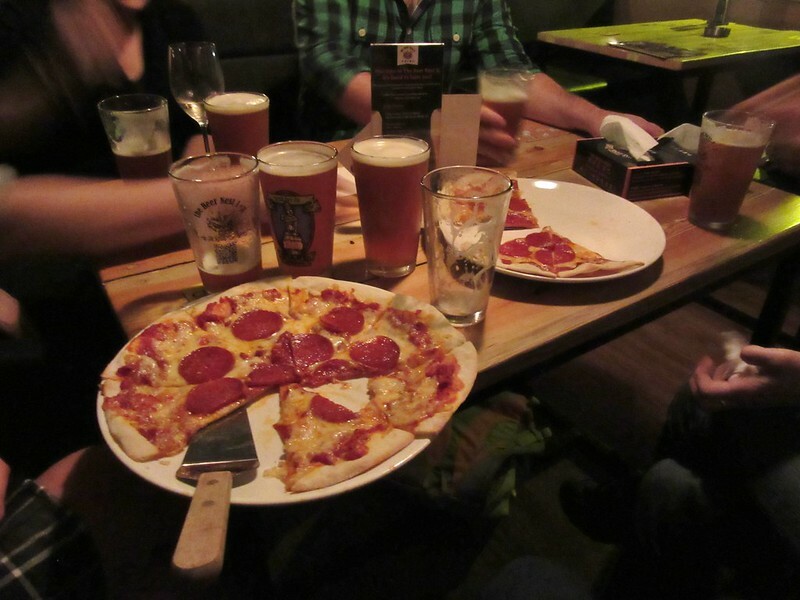 On our final night of four in Chengdu, we went out to an expat bar for pizza, craft beer and a few games of pool. Predictably, after a few pints of normal strength beer (Chinese beer is weak as piss, normally 2-3%) the night progressed and we ended up at a night club until the early hours. Sensible behaviour with a train to catch the next day! We caught the train no problem though, leaving Chengdu with good memories and new friends (and cycling mentors!) who we definitely hope to meet again somewhere, sometime in the future. You guys all said you read our blog, so thanks Nick for your hospitality and thank you Sarah, Scott, Gokben and Nico for being such good company. 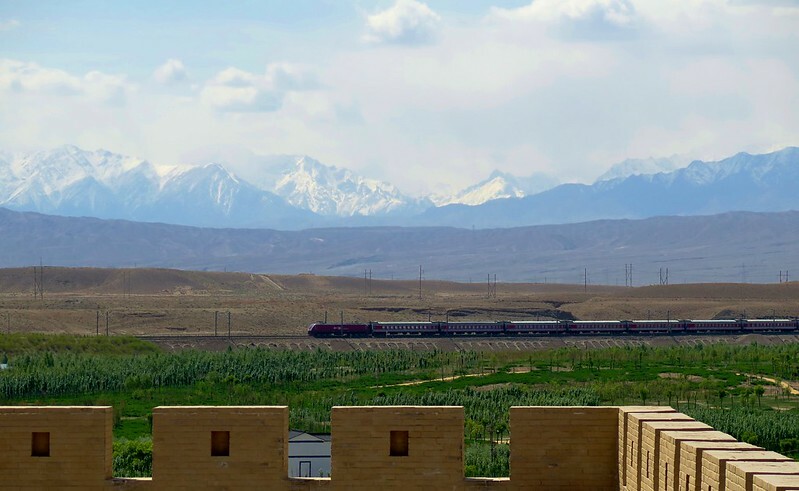 Our first leg on the train took us overnight to Jiayuguan in Gansu province. In our sleeper carriage, darkness fell to green forests and rice fields outside the window. We woke to barren, rocky hills stretching as far as the eye could see. Nothing around, other than the ever present electricity pylons and the odd road. 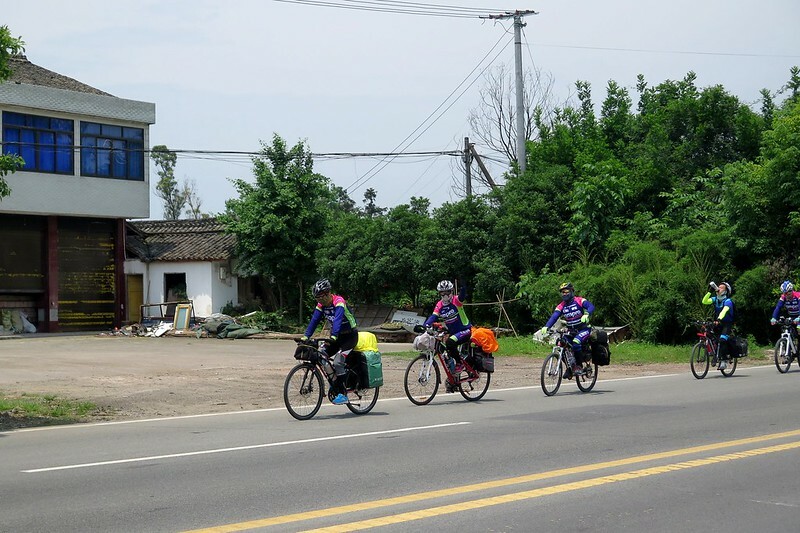 Some hardy cycle tourists ride the whole way through this part of China, but many take the train. We certainly felt happy with our decision. With limited time on visas, to ride the whole way means long days in the saddle with little room for time off to explore or rest. 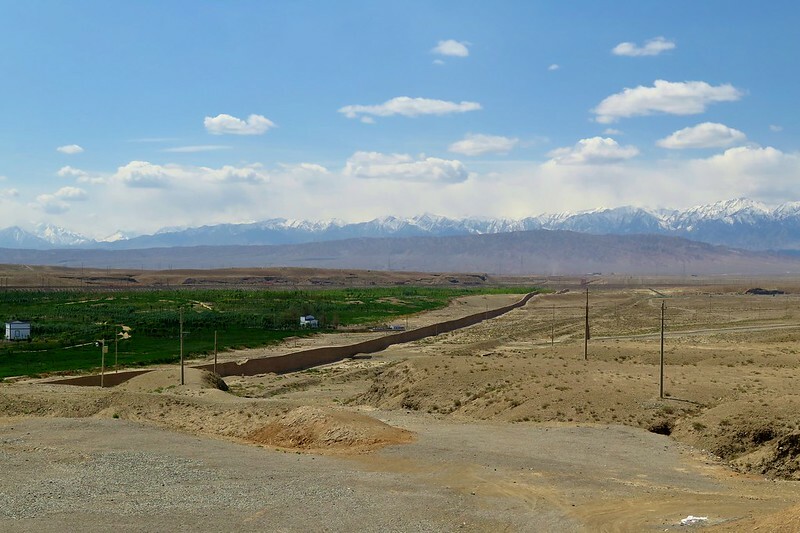 We’ll have a taste of riding through the desert between Urumqi and the Kazakh border, so we are happy to have spent the majority of our time in Yunnan and Sichuan. 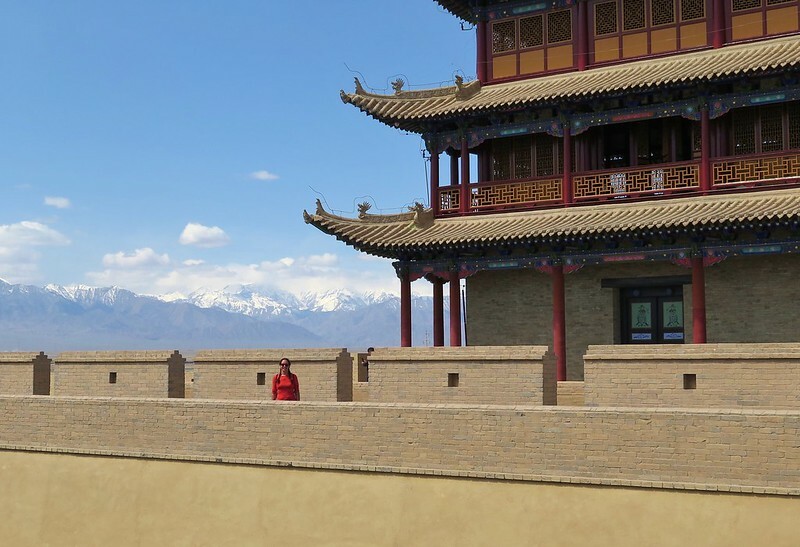 We stopped in Jiayuguan, partly to break up the train journey, but mostly to see the western end of the Great Wall. 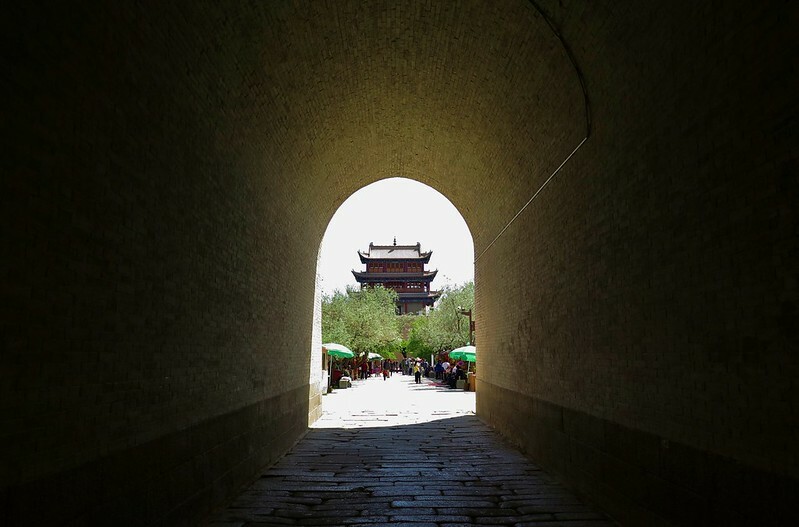 We came into China last year south of Beijing, so had no chance to see it on that side of the country. 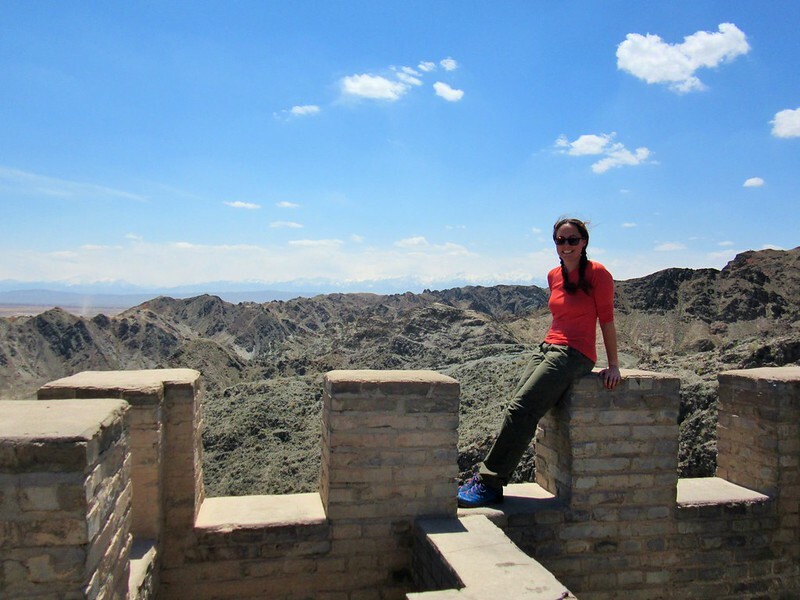 I visited the famous Badaling area many years ago, but Clare has never seen the Wall, and we couldn’t leave China without ticking that box. The landscape over here in the west is incredible. 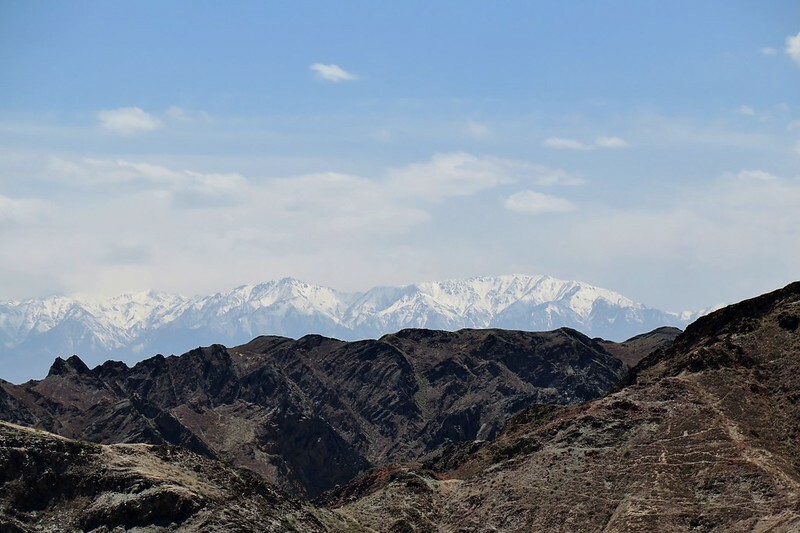 The backdrop was wild open terrain stretching to snowcapped mountains, with a deep blue desert sky above. 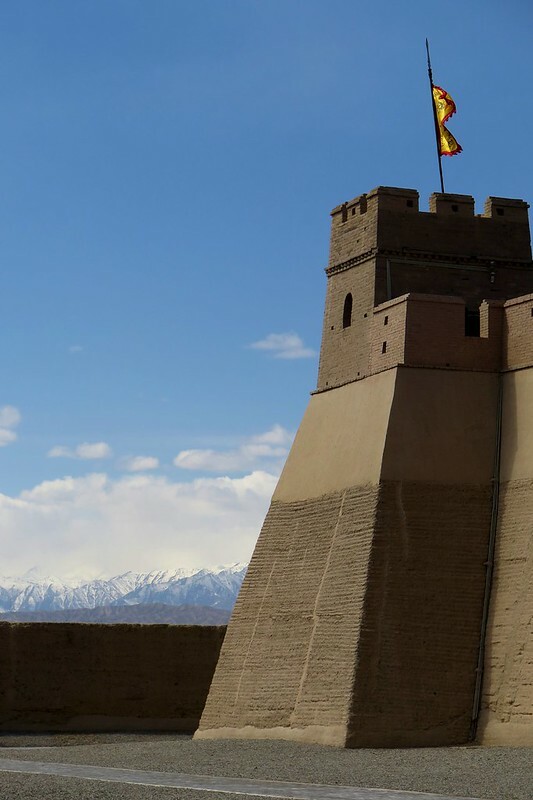 The main fort building was a heavily renovated version of the original and I think the wall in the hills was mostly rebuilt, but it was still an awesome sight. The last stretch of the original wall (the tail of the dragon) was still there as it has been for hundreds of years, disappearing into the distance. 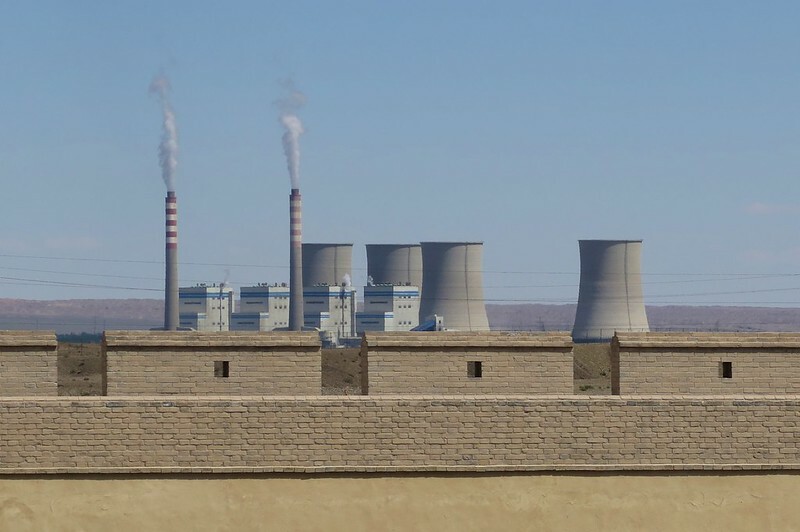 We couldn’t escape one reminder of industrial China, a big coal power station burning away a couple of kilometres beyond the parapets. 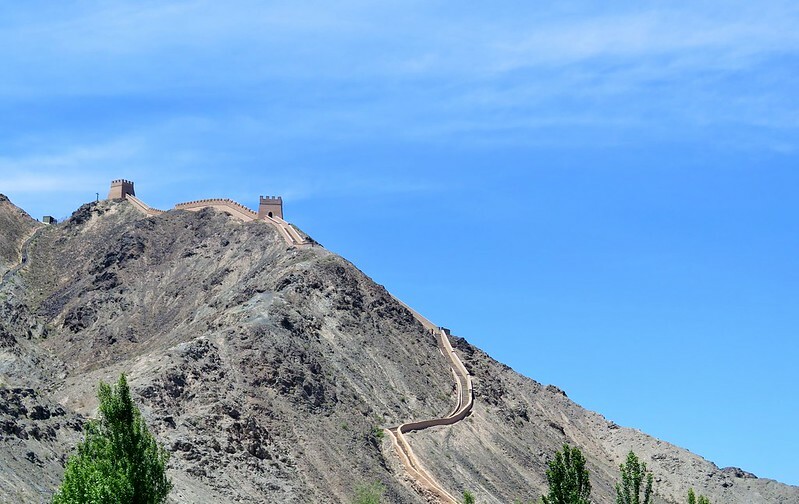 We climbed up the steps the section of wall rising into the mountains to a couple of the watchtowers. Besides the amazing backdrop, the huge advantage of this area is the lack of crowds. There were very few other visitors, especially so as it was mid-week, so we had the place almost to ourselves. 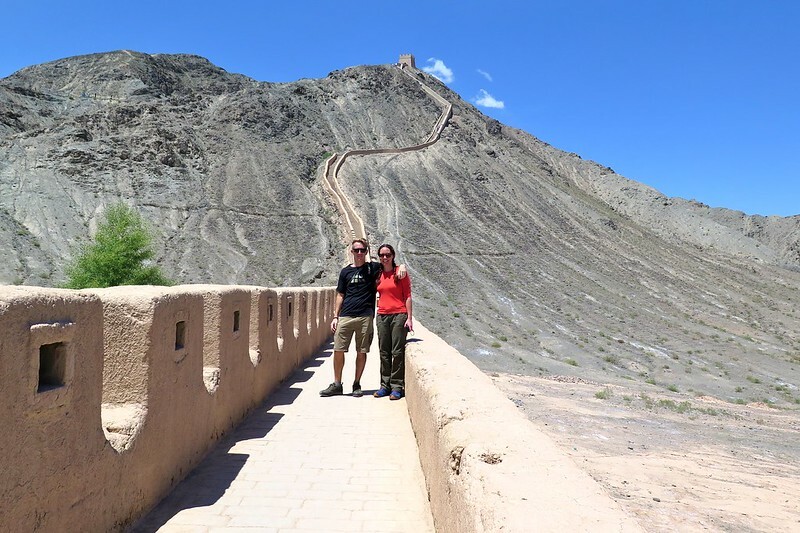 Nothing worse than another tourist getting in the way of a perfect ‘adventure travel’ photo! 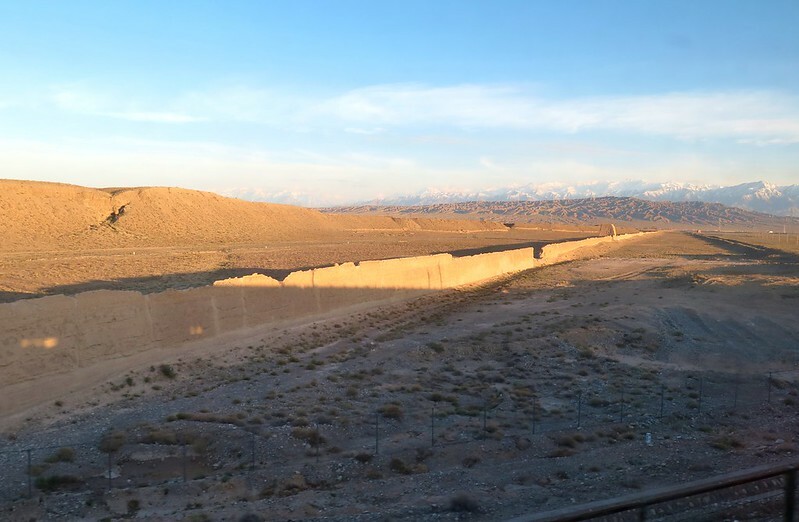 Less than 24 hours in Jiayuguan and we were back on the train, passing through the last remnants of the Great Wall into the wild west, for the next leg to Urumqi. 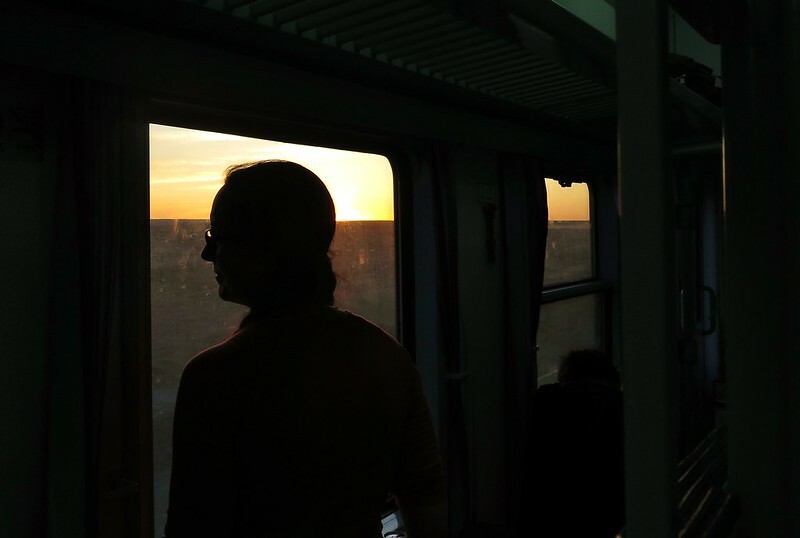 Thanks to China’s single timezone, our train left at around 8pm and we still had a couple of hours left of daylight to enjoy the views. We were treated to a stunning sunset and views of the huge mountains to the south of us. 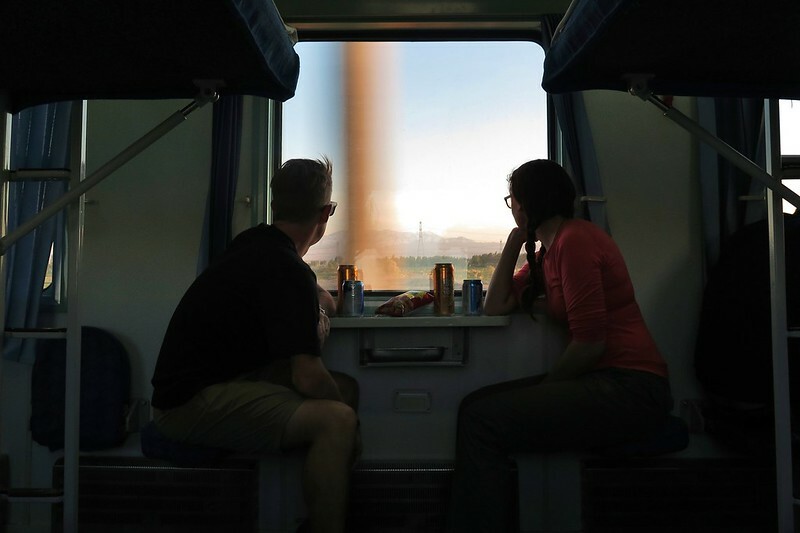 We love a train window view, and have seen some pretty good ones in the past, but this one will take some beating. 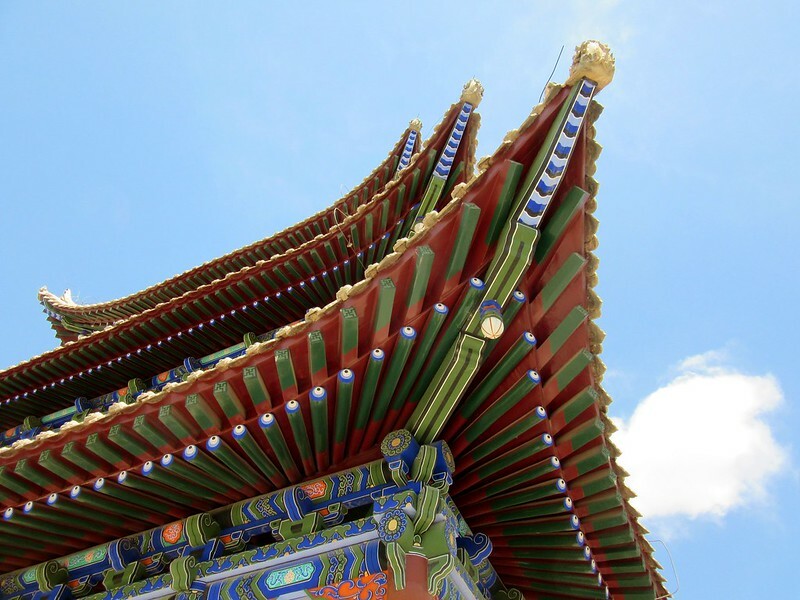 We arrived in Urumqi at dawn the following day. 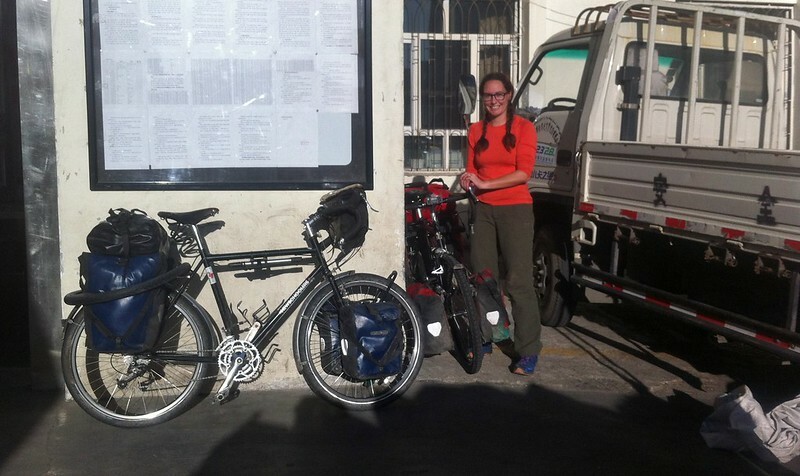 First mission was to claim our bikes and panniers from the freight office. Assuming it wasn’t going to be open that early, we sat outside a locked gate looking like the gormless foreigners we are. Fortunately a woman came over to us and pointed us around the corner to another entrance where we were able to pick up our stuff and get moving. 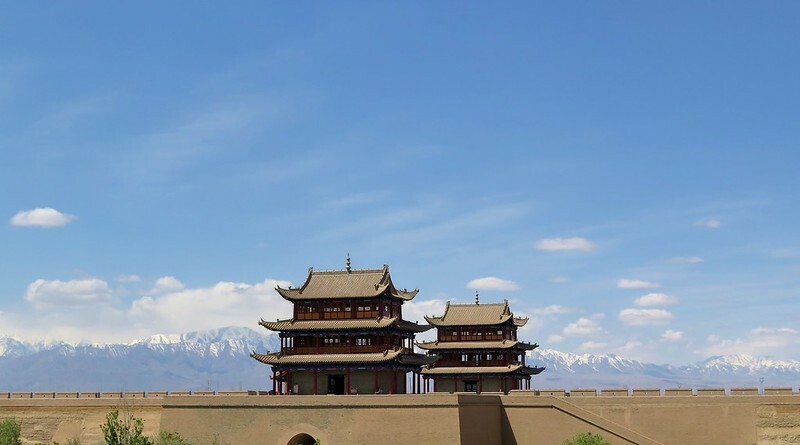 We’ll be in Urumqi for four days, coinciding with our wedding anniversary, so we’ve treated ourselves (any excuse!) to a really nice hotel for our stay. From here on, there will be a lot more camping and roughing it, so we’ll definitely make the most of it and lap up the luxury! It was a quick ride across town, but the traffic was chaotic, more so than in the rest of China. 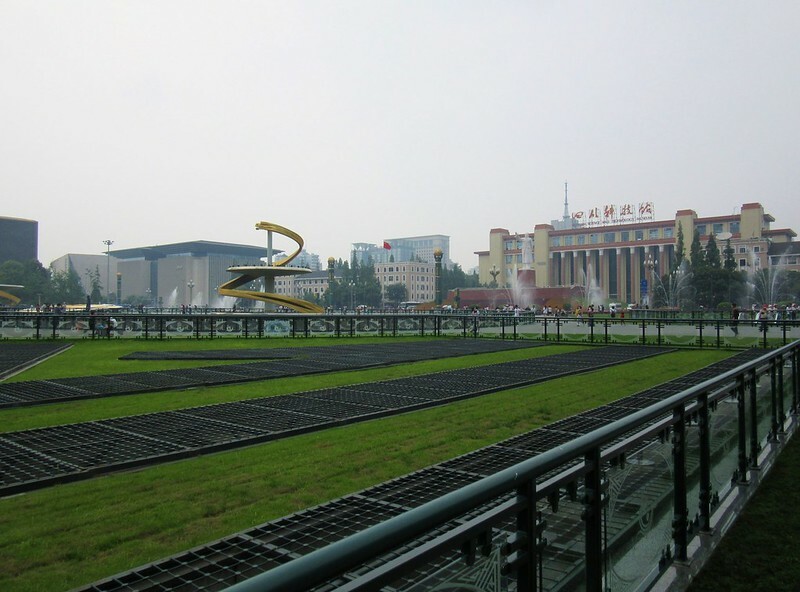 Turns out Urumqi is well known for having too many cars and not enough road space. The city feels familiar in a way, but also very different in others. 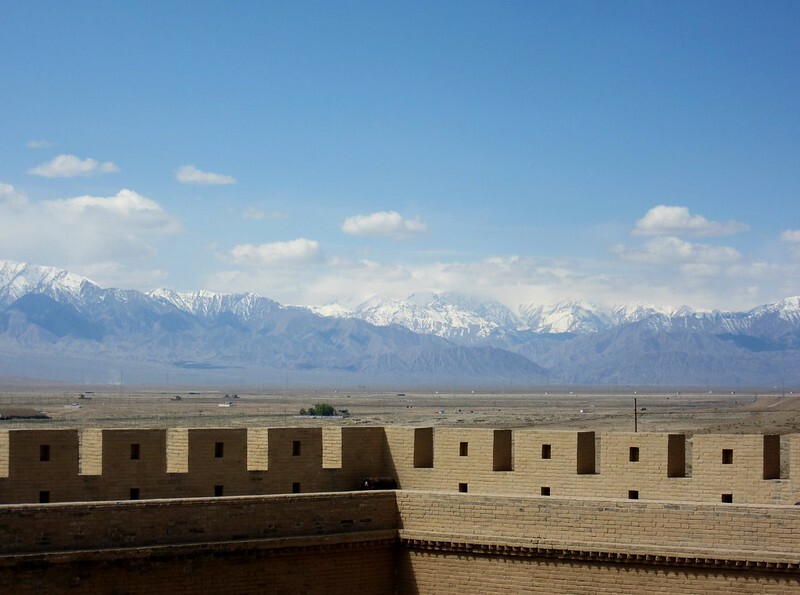 It’s a real mix of ethnicities and cultures, with a large Uyghur community and strong central Asian influence. 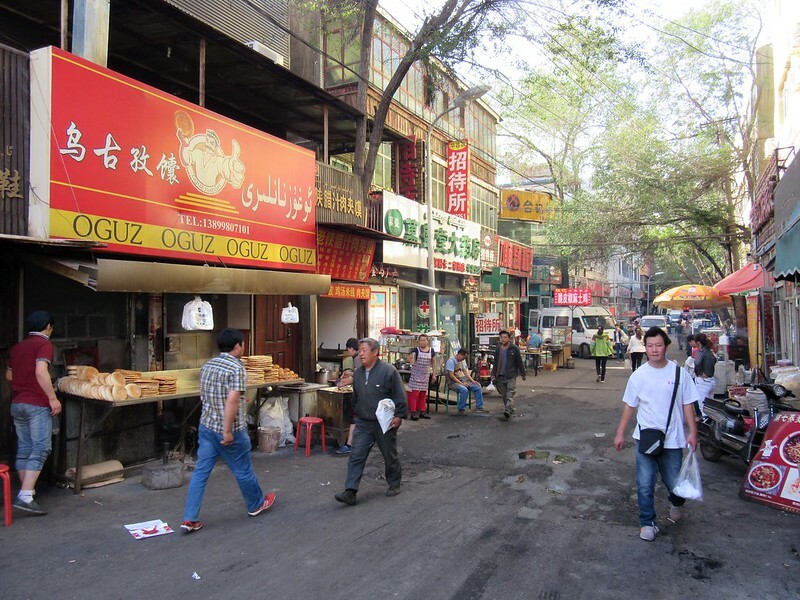 Chinese characters on signs along with Arabic looking Uyghur script and Russian Cyrillic. Nan bread and kebabs on sale beside noodles and steamed buns. Beyond the city lies the desert and mountains. 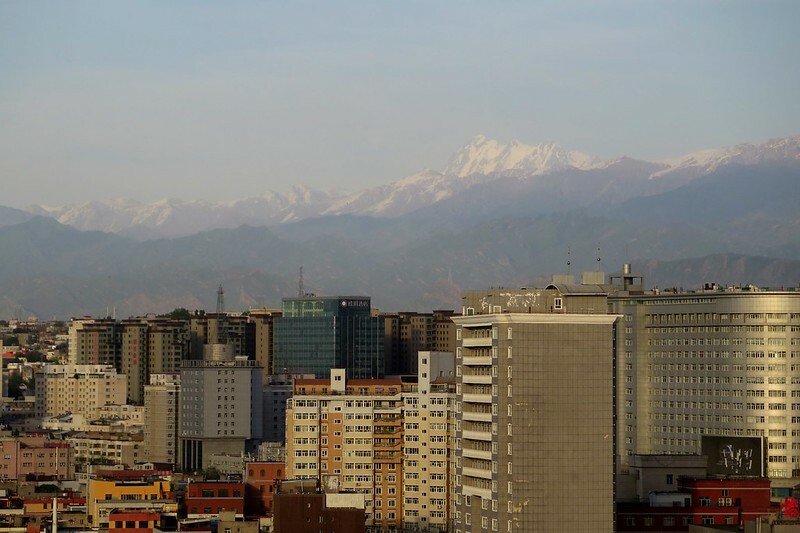 From here, we’ll set off to tackle our final 700km in China to the Kazakh border at Korgas. It’ll be a tough stretch, and the start of Central Asia proper. Great blog again guys. 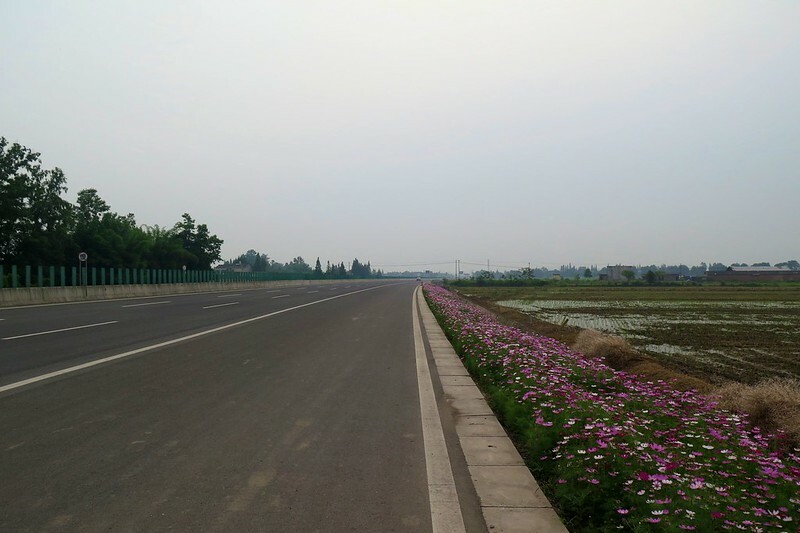 Enjoy the last of your time in China and hope the cycling is not too hard, but lots of interesting scenery. Enjoy and happy anniversary, where have those years gone?